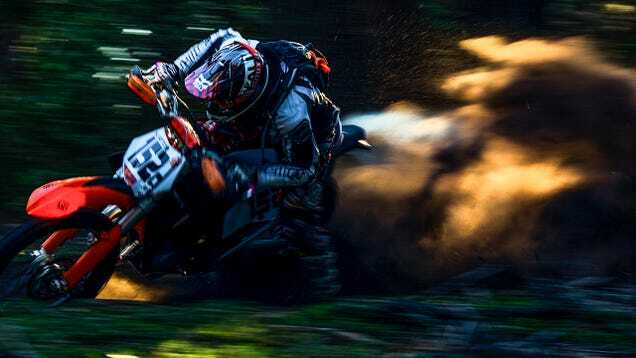 With mountain bike racers now reaching motorcycle speeds, the protection of a full-face helmet is needed. But, street-legal motorcycle helmets have always been too big and too heavy. Enter this new Kali Protectives Shiva, the smallest and lightest helmet of its kind ever made. Kali says the Shiva weighs 1,050 grams in size medium, give or take slight manufacturing variances. Below is a picture of a size large on a scale, weighing an actual 1,065 grams. This is really impressive. 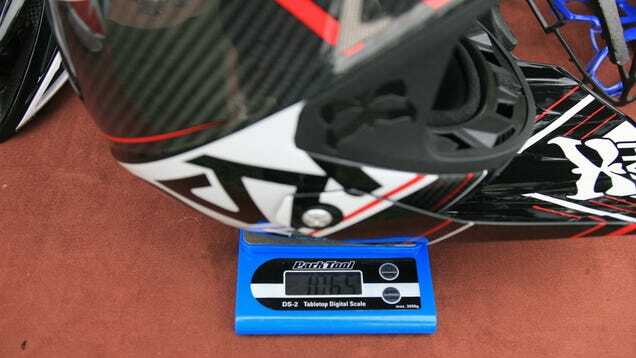 Where other similar helmets like the Airoh Aviator 2.1 claim to be lighter, their real world weights are often measured at hundreds of grams heavier. While Airoh states the Aviator weighs "from 980 grams," independent tests have shown it to weigh as much as 1304 grams for a large. That makes the Shiva the lightest US Department of Transportation (DOT)-certified, full-face helmet there is. Kali's founder Brad Waldron says he's able to achieve such a low weight through a systemic approach to the helmet's construction. This isn't a case of employing radical new materials like Smith's bicycle helmets and their Koroyd construction, it's a case of optimising existing materials so they perform better. Brad's background is in composites design for the defence industry. While at Northrop Grumman, he worked on projects including the B-2 stealth bomber. With Kali Protectives, he's bringing that expertise to action sports. Like every other helmet made since the 1960s (with the exception of the Smith mentioned above), the Shiva is made using an expanded polystyrene foam liner housed in a hard outer shell. Whether it's carbon fibre, plastic or fibreglass, the shell's job is to deflect impact energy, spread point impacts across a larger area and prevent penetration. The polystyrene's job is to absorb that energy, slowing your head's deceleration to a non-lethal rate. In traditional helmets, the two pieces are constructed separately, then fitted together. This inherently results in a small gap between the two pieces. Look at a chart of impact energy over time and, with a traditional helmet, you'll see a spike as the shell impacts the ground, followed by a second, larger spike as the foam closes the gap and hits the shell. 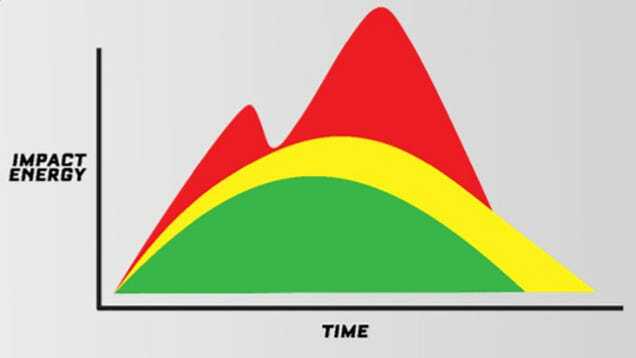 This graph is from Kali and likely exaggerated, but nevertheless gives you an idea of the two-energy-spike timeline (red) of an impact in a traditional two-part helmet. And, what the lower G-force, longer duration impact (yellow and green) that Kali says its solution achieves looks like. Remember we're talking about an end-product that achieves equivalent safety from a lighter weight and smaller size, not a product with more outright energy absorption altogether. But with the Shiva, that double spike disappears, replaced by a longer duration with lower outright transmitted force; all other things being equal. Kali achieves this by "in moulding" the polystyrene directly into the carbon fibre shell. In-moulding has been used in bicycle helmets for a couple of decades, but wasn't applicable to full-face designs due to the challenges in evacuating the pressurised steam used in the process from a more enclosed shape. Waldron tells us the chief innovation that enabled the creation of his helmets was his patented process for evacuating this steam. "Initially, we developed this technology to eliminate that double energy spike," says Brad. "But, we also discovered other benefits." By in-moulding the foam to the shell, the two, formerly separate components become a single, cohesive piece. That means Kali can fit a thinner, lighter shell without sacrificing its strength. That thinner, lighter shell also deforms more easily, providing energy dissipation earlier in an impact and further reducing the severity of the initial G-force spike. Kali also takes advantage of EPS layers shaped like cones (top photo). Where traditional helmets simply layer progressively thicker densities of the material radiating out from the wearer's head, these cone-shaped layers are able to tailor their crush-rates along the point of the cone, starting firmer and ending softer; a merit that allows Kali to run softer, lighter densities in its foam liner. Softer foam is better able to absorb very low speed impacts. The kind which EPS helmets have traditionally struggled to protect against and which can lead to concussions as a result. A helmet designed to protect your head in a 50mph crash is too stiff to absorb a .5mph topple. All together, that adds up to a helmet which is both radically lighter and considerably slimmer than traditional designs. And those attributes bring their own safety benefits too. "A smaller helmet applies less torsion to the wearer in a crash" explains Brad. The smaller the lever, the less force it acts with. Land askew on your head and a larger helmet has the potential to apply more rotational forces to your head and neck. 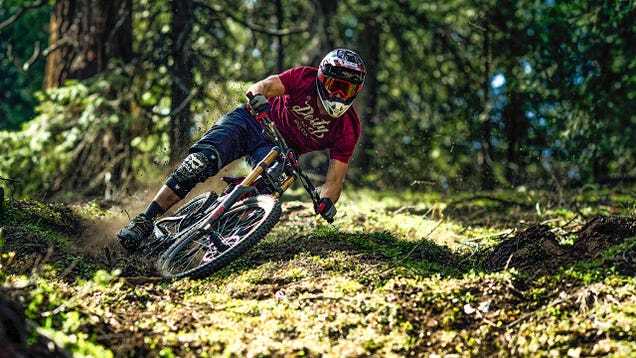 The Shiva is equally applicable to motocross racing, dual-sport riding (on and off-road) and downhill mountain bike racing. Brad tells us the company is also pursuing an ECE 22.05 rating for the Shiva so it can be sold in Europe, but is going to have to strengthen it in some areas to achieve that, likely adding an incremental amount of weight in the process. The goal here wasn't to create a safer helmet, it was to create a lighter, smaller helmet that's as-safe as heavier, larger designs. Or, motorcycle levels of safety in a package that won't feel out of place while you're pedalling.